This is a copy of Delta Meter's Homepage, hosted on Clearbird's server (Nov. 2003). Check the original Delta-meter.com for updates. The Delta 1 meter was developed particularly auditors of the free zone. So you can profit from the highest quality, Delta-meters are manufactured in one-off production. LOW: (low sensitivity), here the sensitivity range ranges from 0.25 to 4,2. HIGH: (high sensitivity), here the sensitivity range ramges from 2.5 to 42, which corresponds within to the range of a normal E-Meter from the free zone. This will in most cases be the setting, with which the Auditor will operate. How does this affect the practicing Auditor? The Auditor sees a "Floating TA", i.e. the needle cannot be held within the needle scale by adjusting the TA potentiometer any longer. Now you can place the sensitivity knob to the TA position. Thus the needle movement is reduced so strongly that a "Floating TA" looks like a normal F/N. On the internal TA scale you can read the range of the "floating TA" easily. The display of the device consists of a highly sensitive instrument movement with black needle. The needle is absorbed, in order to avoid unwanted oszillations. It nevertheless reacts just as fast as a conventional needle, owing to electronic acceleration . Of course the Delta-I meter is equipped with a digital clock. The same display is used for the TA counter. With a simple depression of a button it can be switched between the two modes, i.e. between the time-of-day and the display of the TA movement. The probably most important piece of news is the improved, digital TA counter of the DELTA-I meter. Conventional TA counters are based on the principle of adding the TA downward movements based on the anti-clockwise turns of the TA potentiometer. This principle is possible also with this model, but in addition to this conventional method the a new circuit was developed upon the request by the Sen C/S of the free zone, which enables it to add each needle movement to the right i.e. the amount of TA movement of all "Falls", "Long Falls" and " Blowdowns" is now accurately measured. This gives a far more exact picture of the results of a session to the auditor and the C/S. In order to avoid that by body movements the counting is incorrect, one can interrupt and again activate through pressing of a button. Six rechargeable Ni-Mh batteries supply the energy necessary for at least 100 hours of operation of the device. The charge of the batteries can be read on the Delta-I meter's movement scale in the position " TEST ". The display of the battery charge extends over the entire scale. The needle strikes on the right they are fully charged. If they are empty, then the needle does not deflect. So one can in each case read off the exact charge from the total scale. With the provided battery charger the batteries can be re-charged in approximately 15 hours. There are high-speed battery chargers on request. Upon popular demand the housing was made of wood. It corresponds to the classical Look. The device can be easily set up and used. The cover is hooked in the back and the device is tilt then to 45 degrees. For this Delta-1 meter DELTRONICS gives a warranty of 12 months starting from the date of purchase. This includes free recovering of material and production errors. 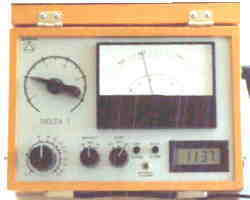 The Delta-I meter is supplied complete with a can connection cable and battery charger, but without cans.